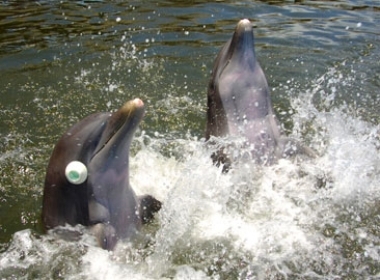 This study explored what dolphins understand about hidden objects. 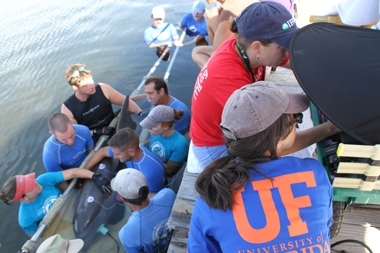 Our staff and dolphins are currently working on a number of cognitive and behavioral research projects. Publication announcements and details of our findings will be featured in our bi-monthly newsletter for members, and here on our website. Aleta and Calusa approach the underwater buttons. Aleta and Calusa simultaneously press their underwater buttons to solve the task. Cooperation can be found across the animal kingdom, but do cooperating animals actively coordinate their behavior, or are they simply acting individually in the same place and time? This study at Dolphin Research Center investigated whether bottlenose dolphins could understand their partner’s role in a cooperative situation by testing whether they could learn a task requiring precise behavioral coordination between partners. To succeed, pairs of dolphins had to swim across a lagoon and each press their own button simultaneously, whether sent together or with a delay between them of up to 20 seconds. The results showed the dolphins were able to work together with extreme precision even when they had to wait for their partner. In the wild, dolphins show synchronous breathing between moms and calves, and synchronous coordinated displays between allied males. 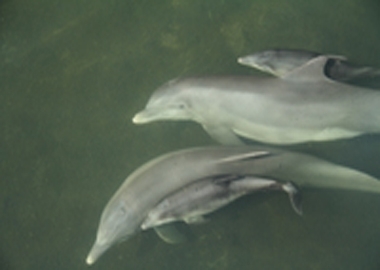 This study showed that dolphins understand their partner’s role in a cooperative context (as shown by the fact that they waited and actively coordinated), and suggests that the behavioral synchronization bottlenose dolphins show in the wild may in fact be a generalized cognitive ability that they can apply to a variety of situations. DRC staff members gently hold A.J. while the hearing test is conducted. The primary sense in dolphins is hearing and a large portion of the dolphin brain is devoted to the auditory processing of echolocation signals. Hearing deficits in dolphins potentially compromise the ability to forage, navigate, socialize, and evade predators. This presents a challenge to survival and reproduction in wild dolphins and can affect the general welfare of dolphins under human care. Currently, little empirical information on how dolphin behavior is affected by hearing loss exists. This study investigated hearing deficits in several species of stranded dolphins and age-related hearing deficits in dolphins that live in human care through auditory evoked potential (AEP) testing and evaluated whether individual behavior correlated with hearing impairment. Pandora and Calusa's maternal whistles were studied with daughters Atocha and Cacica. Individual vocal signatures help mothers recognize and provide care to their young in many animals. Mother-offspring recognition is particularly important when young animals are mobile immediately after birth, and separations can occur. 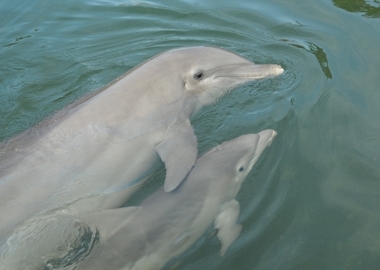 Bottlenose dolphins are known to produce unique identity signals – signature whistles – to help individuals recognize one another. In this study, we show that new dolphin mothers produce their signature whistle at much higher rates immediately after their calf is born, and continue to do so for up to a month. This increase helps the calf recognize its mother and allows mothers and calves to reunite if they become separated. Merina used her signature whistle to retrieve her wandering daughter, Windley. Female dolphins and their calves use their highly individualized signature whistles to identify and maintain contact with one another. It was previously known that when yearling calves separate from their mom, they produce their own whistle. However, little was known about the mechanisms a female dolphin may employ when she wants to reunite with her calf. In this study, we asked a female dolphin to retrieve either her wandering calf or series of inanimate objects (as a control). Unlike the way human mothers call their children, our results show that a dolphin mother used her own vocal signature to actively recruit her calf, and produced no such signal when asked to retrieve the objects. The results highlight that signature whistles are not only used in broadcasting individual identity, but that maternal signature whistle use is important in facilitating mother-calf reunions. 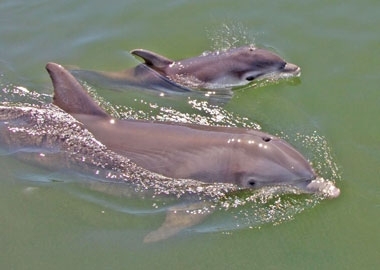 Wild dolphins have been studied on both sides of us -- in Key West and in the Upper Keys. No one, however, has looked at dolphins between those areas. DRC is centrally located in the heart of the Florida Keys, perfectly positioning us for this undertaking. This research project will look at the abundance, distribution, and behavior of the dolphins of the Middle Keys. Our results will contribute significantly to agencies that are responsible for implementing the Marine Mammal Protection Act, and will have a direct impact on conservation efforts in waters surrounding the Middle Keys. The data we collect can also provide crucial baseline information on this dolphin population in the event of an environmental catastrophe. These research activities are being conducted under Letter of Confirmation # 18218 from the National Marine Fisheries Service, which affirms General Authorization for Scientific Research. All of DRC's cognitive research relates to our overarching goal of mapping the dolphin mind – understanding how dolphins think and learn. And with as much time as we spend on figuring out the individual pieces, it's also important visualize the entire picture. Recently, Oxford University Press invited DRC to write such a "big picture" chapter, detailing what is known about dolphin cognition, how the pieces fit together, and providing a roadmap of the next steps researchers should take to continue filling in that picture. 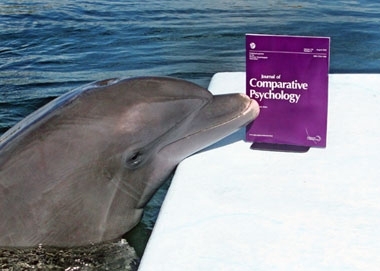 The chapter “Cetacean Cognitive Specializations” will be in The Oxford Handbook of Comparative Evolutionary Psychology. Tanner is able to copy Kibby's splash, without eyesight. Blindfolded, Tanner is still able to imitate AJ's wave. We’ve all heard the expression “monkey see, monkey do" - but actually, that's a myth. Imitation is very rare in the animal kingdom. Chimpanzees can imitate sometimes, but – apart from humans – the animal that is the best at imitation is the dolphin. We wanted to explore this ability further. 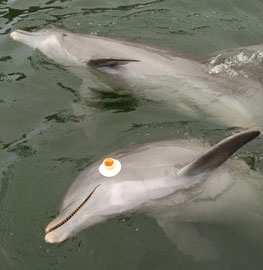 In our first study, Blindfolded Imitation in a Bottlenose Dolphin (Tursiops truncatus) that was published by the International Journal of Comparative Psychology, we asked Tanner to copy the behaviors of another dolphin while wearing eyecups (soft, latex suction cups that completely cover his eyes). And….he could do it! But how? Without the ability to use his vision, he must have used sound, either by echolocating to "see" the behavior, or by recognizing the characteristic sound the behavior makes. Our second study, called Switching Strategies: A Dolphin's use of Passive and Active Acoustics to Imitate Motor Actions, discovered that when a dolphin could recognize the behavior by its characteristic sound, he did so. When he did not, he chose to use his echolocation in order to answer the question. This study was published in Animal Cognition. With these studies, DRC has shown that dolphins not only have the ability to imitate, but can imitate with a kind of problem-solving flexibility that's never been seen outside of humans. For the full text of the second study, please email research@dolphins.org. Artificial insemination (AI) is increasingly utilized to maintain genetic diversity in bottlenose dolphin populations in human care, maximizing the gene pool without the risks and social disruption of transporting animals between facilities for breeding loans. But, for successful AI to occur there must be a way to identify when a female dolphin ovulates. Luteinizing hormone (LH) is a hormone produced in the body that is thought to trigger ovulation. Before ovulation occurs, a preovulatory follicle (POF) develops, which houses the egg until ovulation. To better understand the relationship between POF development, the ovulatory LH surge and ovulation, Holley Muraco, a PhD student in Reproductive Physiology at Mississippi State University, worked with Dolphin Research Center's Medical Director, Pat Clough, to characterize dolphin ovulatory estrous cycles by using multiple daily sampling of conditioned dolphins at several different facilities, including Dolphin Research Center. Non-invasive, voluntary techniques, including ultrasound and voluntary urine collection, were used. The study concluded that bottlenose dolphins have brief measurable ovulatory LH surges lasting approximately 6 hours, followed by ovulation within 24-48 hours, and that during the LH surge the POF remained an intact significant round structure with an average diameter of 1.9cm, observable by trans abdominal ultrasound. Gaining a better understanding of these ‘fleeting’ processes will assist in the planning for artificial insemination and maximize controlled natural breeding programs. Which bucket contains the hidden object? 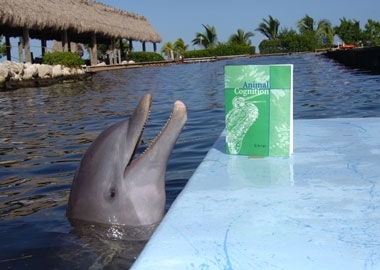 Tanner investigates the scientific journal Animal Cognition, where DRC published our findings about what dolphins understand about hidden objects. The ability to reason about objects that have disappeared from view, which is known as object permanence, has been studied in many terrestrial animals, but DRC is the first to explore this with marine mammals. 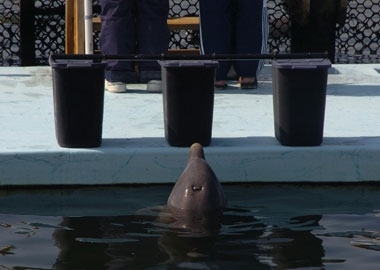 In this study, we taught our dolphins a game in which we hid an object in one of three buckets, and then asked them to find it. ("Where is it?") The question was whether they would track the object, and then keep in mind where the object is. And they did. But we also discovered some tasks they couldn’t do – such as when we placed the object in a bucket, and then moved the bucket. It's not certain why this task was difficult for them. One possibility is that they might lack an understanding of moving containers (which don't exist in their natural environment). Another is that, due to echolocation, they don't need the ability to mentally track an object that disappears from view. Further research can help us figure out this puzzle. 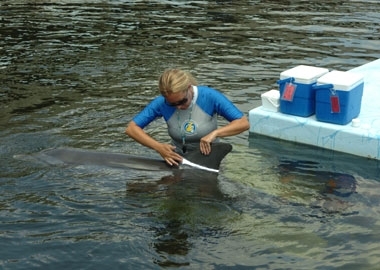 Dr. Sklansky uses ultrasound to look within a pregnant dolphin, to study the calf's heart. During human pregnancies, a variety of clinical tests and procedures are conducted to provide information about the developing baby. One such procedure, fetal echocardiography, uses sound waves (ultrasound) to study the structure and function of a baby’s heart before birth. DRC regularly uses ultrasound as a helpful diagnostic tool to monitor our dolphins’ health in other areas. Could fetal echocardiography be adapted to pregnant dolphins and their calves? Dr. Mark Sklansky, the Director of the Fetal Cardiology Program at the Children’s Hospital in Los Angeles, came to DRC to investigate. Working with several members of DRC staff and our veterinarian, Dr. Sklansky was able to apply his techniques to evaluate the cardiovascular health of four calves prior to birth. Combined with similar work at other facilities, he has concluded that fetal echocardiography can safely and effectively evaluate a calf’s heart. This has the potential to be a valuable clinical tool for monitoring our dolphins’ pregnancies. In addition, further research may help to increase the overall understanding of calf cardiovascular development and the specialized adaptations of marine mammals. Quantities can be arranged in an order, from less to more. Talon choosing the board with "less" dots. Rainbow studies the Journal of Comparative Psychology, where the “Less” study was published. The ability to understand number and counting is often thought to be specific to humans. Over the last few decades, studies have shown that terrestrial mammals and birds can understand various numerical concepts, and that in primates at least, these numerical concepts can be very advanced. There are at least four types of skills that underlie basic human competence with number and math. 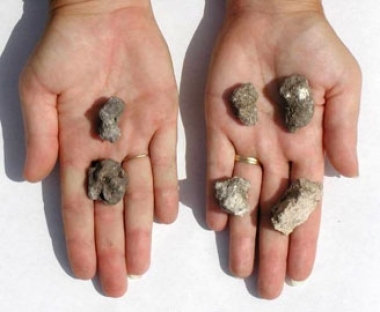 Recognizing numerosities – distinguishing, for example that “threeness” is different from “twoness”; i.e., knowing that a set of 3 objects is distinct from a set of 2 objects. Mapping numerosities to symbols – learning for example that “1” goes with “oneness”, “2” goes with “twoness”. Manipulating numerals – e.g. addition and subtraction. Do dolphins have the capacity for these kinds of skills? If so, what are their competencies in relation to the rest of the animal kingdom and to human child development? DRC’s Research Department, led by Dr. Kelly Jaakkola, is addressing these questions. In our “Less” project, we researched the ability of dolphins to understand the first two concepts -- numerosity and relative numerosity. Two of our dolphins, Talon and Rainbow, participated in this study. We began by showing each dolphin two boards with different numbers of dots on them: 2 and 6, for example. First, we asked them to always pick the board with 2 dots on it, no matter where the dots were on the board or what size they were. 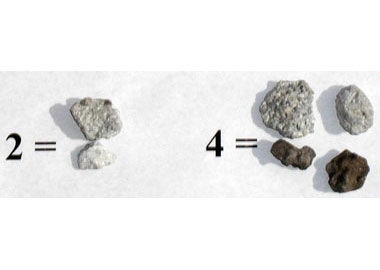 Learning this task meant that Talon and Rainbow understood that 2 is different than 6, which is the concept of numerosity. The next step was to test with other number pairs that were new to the dolphins, and always ask Talon and Rainbow to choose the board that had the fewest dots on it. The ability to pick out the smaller number without being trained on that specific number pair meant that they understood the concept of “less” (i.e. 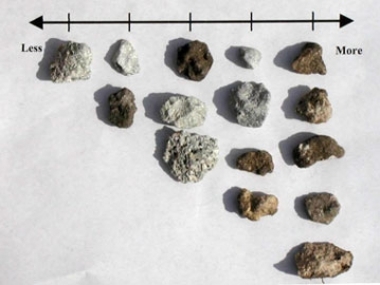 relative numerosity). Read about the study in the American Psychology Association's Monitor on Psychology (Vol. 36, No. 8). Mother-calf social interactions are very difficult to observe in the wild, so valuable information can be learned from every calf born at DRC. The social development of each calf is monitored closely to determine how much time the calf spends with his or her mother, how much time is spent with other lagoon-mates, and how much time is spent alone. Changes in independence are tracked over time, so that eventually, different mother-calf pairs can be compared. Particularly interesting will be comparisons involving the same mother with successive calves so that we may see if birth order has an effect on parenting style. In addition, we will be able to assess whether previous experience as a babysitter, or alloparent in scientific terms, can be used as a predictor of good maternal care when the alloparent becomes a parent. 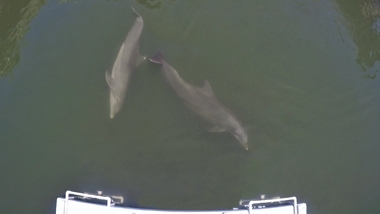 To ensure observer's reliability in dolphin identification, Emily Guarino, Admin. 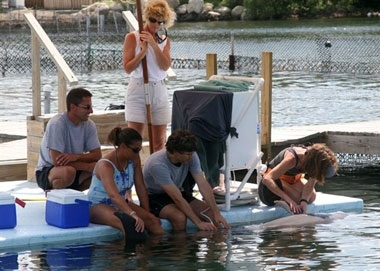 Director of Research, applies harmless zinc oxide to a dolphin's dorsal fin. Staff at DRC collect data under a variety of circumstances to monitor the general health and well being of our family of dolphins and sea lions. For example, if a dolphin moves into a new lagoon, we want to ensure that (s)he is comfortable in that new environment and social grouping. Or, if a dolphin is feeling a little under the weather, we may monitor their respiration rate. Information like this can help us to make decisions to promote the health and happiness of the dolphins and sea lions that call DRC home. Natua was the first non-human animal to show evidence of metacognition. A fundamental characteristic of higher levels of consciousness is the awareness of one's own thoughts and feelings. Do dolphins have this kind of awareness? This was the question addressed in a study by Jonathan Schull of Haverford College and David Smith of the New School for Social Research. In the experiment, the dolphin, Natua, heard either a variable low tone or a high tone, and learned to press corresponding paddles. Natua had no difficulty with most of the trials. But on some trials, the variable tone would approach the pitch of the high tone, which made it difficult to determine if it was to be considered high or low. These crucial trials were too difficult for the dolphin to be sure of success. On these trials, the dolphin could make a special response to ask for an easier trial, but it would only make sense to do that if he KNEW that he DIDN'T KNOW THE ANSWER. Schull and Smith pointed out that by "bailing out" of these most difficult trials, Natua demonstrated that he was aware of his own doubts, that he could think about his own thinking. This ability is known as metacognition. The data produced was comparable to that collected for humans and rhesus monkeys. Would the presence of dolphins act as reinforcement to help increase learning for children with mental disabilities? Dr. David Nathanson came to DRC to investigate. 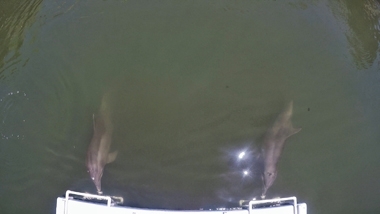 Six children were taught new vocabulary words through interaction with dolphins. Results indicated the children learned two to ten times faster and with greater retention when working with the dolphins. Benefits included increased evidence of the efficacy of using non-human species to increase attention, elicit speech, and increase memory for people with disabilities. One question remained: was it the dolphins’ presence that made the difference, or simply being in-water? To find out, he then compared the effectiveness of in-water work without dolphins to in-water work with dolphins on the learning improvement of children with mental disabilities. Sessions without the dolphins were conducted out of sight of the dolphins at a nearby beach, and the reinforcement for a correct response was the child's favorite water toy. 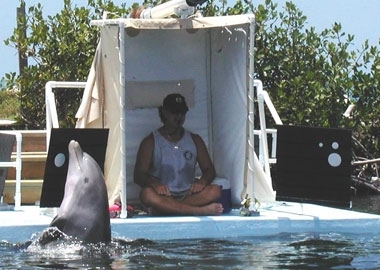 Significant improvements in responses occurred when interaction with dolphins was used as reinforcement, compared to responses made when reinforcement was a favorite toy. Water work with dolphins evoked both a greater number and higher level of responses. The objective of this study was to determine if bottlenose dolphins could detect an oil slick on the surface of the water. In the initial experiment, the dolphins viewed a transparent cylinder and learned to press a paddle when they detected something in the cylinder besides water. It was demonstrated that dolphins could discriminate between oil and the uncontaminated surface of the water. This project also showed that dolphins would avoid an oil slick, as they would hesitate to swim beneath one when detected. Their few contacts with the oil (either accidental or as part of an investigative process) resulted in an overt startle response, which set a pattern for subsequent avoidance. Overall, the dolphins avoided oil both during the day and at night, although the response broke down when the threshold of their ability to detect the oil was reached. 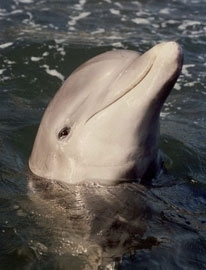 Visual cues were instrumental in the dolphins' detection of the oil, and tactile sense played the most important role in their response to the oil. Memory of its location influenced their behavior, even after the oil was removed.